MWC19 Barcelona was buzzing about 5G, robots and other disruptive innovations. This year, there were a few trends that stood out that bring better connectivity from IoT to enterprise businesses, including our own. It is difficult to ignore the conversations around 5G and its future applications. The connectivity will provide businesses and consumers with better service reliability while offering improved speed, flexibility and agility for exceptional performance. The network offers more opportunity once it reaches more markets and becomes commonplace. However, there are other developments to consider. MWC19 is a huge show after all! The first was artificial intelligence (AI) that is already having a transformative effect on the global economy. Of particular interest was AI in silicon at the chip level. This technology could prove to be low in cost and power requirements for truly intelligent devices. Looking at Industry 4.0, companies are realizing the benefits from being connected, whether from reducing manual processes to making informed decisions. Yet, fragmentation in the telematics market especially is evident with larger, non-telematics companies offering fleet management services. Experienced providers remain competitive by partnering with knowledgeable telematics service providers to integrate enhanced functionality and build out a more complete service offering. For example, providers can integrate AI and vehicle-mounted cameras into a fleet management system to improve driver behavior and road safety. 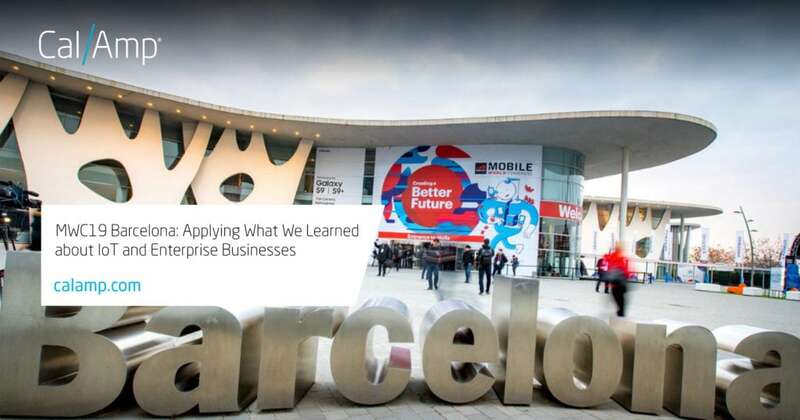 Dialogue that swirled around MWC19 Barcelona drew out the top pain points for enterprise executives across the globe and put a spotlight on the most advanced solutions transforming the modern workplace by creating organizational change. At CalAmp, we understand that no two customers have the same needs, and no solution fits all. Our recent news brings intelligent connectivity as a service to market through CalAmp iOn, a cloud-based platform with many fleet and asset management options to subscription-based telematics services. These solutions enhance the connected vehicle ecosystem and even power smarter micromobility. IoT is driving innovation and creating new business models because of increased connectivity and automated processes. Enterprise businesses that are disrupting in their industry are applying software, hardware and cloud technology to connect departments, networks and service partners to capture actionable data insights that drive the best possible ROI for their business. As these trends continue to mature, we look forward to seeing a closer integration of connected vehicles and high-value assets with the mobile workforce. Automation, AI – even 5G – enable the flow of data so it can be put in motion to power business-critical decisions and transform how business is done. Overcoming objections and embracing a digital transformation can mean the difference between being left behind and being at the forefront of your industry.